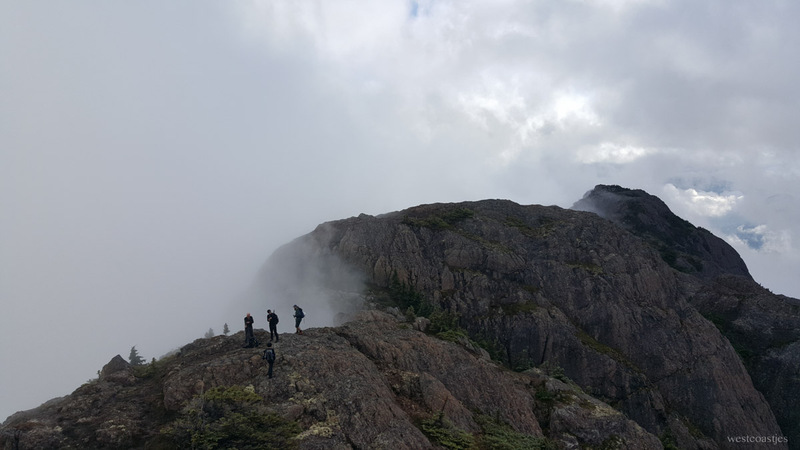 I always want to connect with new hiking and climbing partners mountains, so I finally joined the Alpine Club of Canada (ACC). Sometimes I feel apprehensive hiking with strangers. I worry about being the slowest person. Or what I’ll do if people are taking unnecessary risks or are unprepared. Or if I’ll being the odd one out. This requires extra effort figuring out if it’s safe it is to be myself or if I need to hold back and blend (i.e. being the only woman & queer person on a 2 week mountaineering trip). So I thought a good first ACC trip would be a day hike somewhere I’ve already been… Mt. Arrowsmith! Found on Flickr! Click on the photo to head on to this photographer’s page. In February, I went up the easiest route (Judges) with some friends in search of winter. Judges route on Arrowsmith, February 2015. Sadly almost snow free. For this hike, we met at 6am in Langford for carpooling. Then we headed off on the 2 hour drive north towards Port Alberni. The first part of the Unjudges route is through the forest. I was excited about the fog as it creates opportunities for beautiful photos. After a bit of an uphill slog, we were above the trees! There was a bit of exposure, but on a wide, flat path. I love the sense of being very high up, so this was good fun for me. Then we got to scramble a bit, but still relatively easy terrain and very limited exposure. The fog started clearing around mid-day, which let us catch a glimpse at our beautiful surroundings. Then the fog quickly moved back in again. We started moving along the bumps to get towards the main summit. The very last bit before the summit made me pause and think through my moves. It felt like an easy boulder problem in the climbing gym. Very limited exposure at this point so I didn’t feel like I needed a rope. But I definitely did not want to lose my footing & slip down the rock face. This was the hardest part of the route, but I moved through it in about 10 minutes. Then we arrived at the summit! I took the requisite summit selfie, but there was so much fog it was not a very impressive. I could be anywhere! But I was actually on Arrowsmith. This was also my second time taking out my new hiking boots! They made all the world of a difference in me being able to move quickly and confidently through wet & rocky terrain. We then headed down Judges route and made a loop back to our parked cars on the dirt and gravel logging road. Since this trip, I’ve been thing a lot about the rating of routes. As a newbie, I am still trying to match what I see on the trail with what I read, so I can plan trips within my & my friends’ abilities. I heard that Unjudges was considered a fourth class route, the same as Triple Peak. Having done both within weeks of each other, I felt confused as these routes were in no way similar FOR ME in terms of the butterflies in my stomach. Class 4: Simple climbing with exposure. A rope is often used. Natural protection can be easily found. Falls may well be fatal. Yep, that was Triple Peak! But Unjudges … errr…. really?!? Then I cracked my Island Alpine Select and read that it’s mostly considered third class scrambling, with “the last step” being fourth class. Class 3: Scrambling with increased exposure. Handholds are necessary. A rope should be available for learning climbers, but is usually not required. Falls could easily be fatal. Yes! Yes, that (mostly) makes sense to me! Lesson for the day: Read the damn guide book. Exposure shouldn’t be considered in the rating system and often isn’t. The biggest factors should be inclination and ease of foot and hand holds as well as the spacing between those holds.